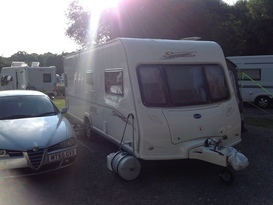 Camplify is the fastest growing peer-to-peer caravan hire and motorhome rental community in the UK. We connect local owners of static caravans, touring caravans, campervans, motorhomes and trailer tents with holidaymakers seeking to experience the joys of camping on the Isle of Wight. Located just off the south coast of England and two hours from London via ferry, the Isle of Wight is known as ‘the UK’s Holiday Island’. Every summer, festival goers flock to the island for famous Isle of Wight Festival which takes place in the town of Newport in June. Heaps of legendary performances has taken place at the festival, which started at the end of the 60s during the summer of love. But the island has so much more to offer holidaymakers year round, including well-established cycling routes, fantastic beaches, tons of adventure sports, and the freshest local produce. It really is the perfect place to go camping for a weekend or a week long. Hiring a caravan is a great way to enjoy the Isle of Wight Festival, whether you want to stay onsite or prefer to stay in a more relaxed location farther away. In fact, even if you are not a festival-goer, festival season can be one of the best times to enjoy the island because many locals flock to Newport, leaving the beaches and coastal villages quieter than usual. The Isle of Wight is a great place to take a caravan holiday any time of year because there is so much to do. Family fun, heritage and history, theater and entertainment, adventure activities, award-winning beaches – you’ll find it all on the Isle of Wight. Through Camplify, you can organise for a local caravan owner to drop their vehicle off at your destination on the island, or choose to drive the RV yourself. You can also hire a static caravan or lodge at a variety of holiday parks. Simply pick a campsite such as one in the Yorkshire Dales or a seaside site in Robin Hood Bay, and roll up ready to unwind and explore. Here's some of our featured vans for Isle of Wight. We have many more! Head over to our Search page to find the perfect caravan or motorhome for your holiday.